Join us for A Stellar Holiday on December 1! The 11th Annual Holiday Tea & Fashion Show will be Friday, December 1. The event is hosted at both at the Elston Homestead and Lane Place and is a major fundraiser for the General Lew Wallace Study & Museum. Ticket-holders may visit the holiday event any time between 3:00 and 6:00 p.m. The impressive Elston Homestead, located on Pike Street, was the childhood home of Susan Elston Wallace and is now home to Wabash College President, Gregory Hess, and his wife, Lora. It will be elaborately decorated for the holiday season by designers from Milligan’s Flowers & Gifts. Event goers can also enjoy an interactive fashion show beginning at 3:30 featuring local models wearing fashions from local boutique heathcliff. Tea and coffee will be served in the historic Elston family silver. Savory treats with an assortment of sandwiches and sweets will be available. Special thanks go to Bon Appétit and tea committee members for the preparation and festive presentation of the food and drink. Door prizes will be awarded throughout the afternoon. All tea attendees will be entered and need not be present to win. Door prizes will be distributed between 4:00-6:00 p.m.
A highlight of the event will be live holiday music by the T-Tones, a men’s vocal ensemble from Wabash College, back by popular demand. Reservations for the Holiday High Tea & Fashion Show are $25 per person and due by November 30. No tickets will be available at the door. To reserve places for you and your guests, contact the General Lew Wallace Study & Museum at (765)362-5769 or e-mail at [email protected]. You may also purchase your ticket here at our website. 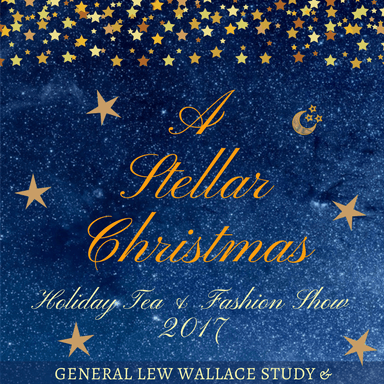 Proceeds from ticket sales directly benefit the General Lew Wallace Study & Museum and the Lane Place. in the time frame of a sworn document purchased by Hobrock’s Robison Park Farms Museum. We have the lamps and the sworn document these were from Gen Lew Wallace Coach during his residence in Crawfordsville Ind. Please respond.